Medical records are also widely known as health information management. It is an organized station that manages health information data by guaranteeing its accuracy, quality, accessibility, and security in electronic and paper systems. Classifications systems are utilized in order to categorize and code patients’ information for purposes of reimbursement. To maintain the medical history of a patient along with their treatment histories, databases and registries are used. Also, see confidentiality forms. 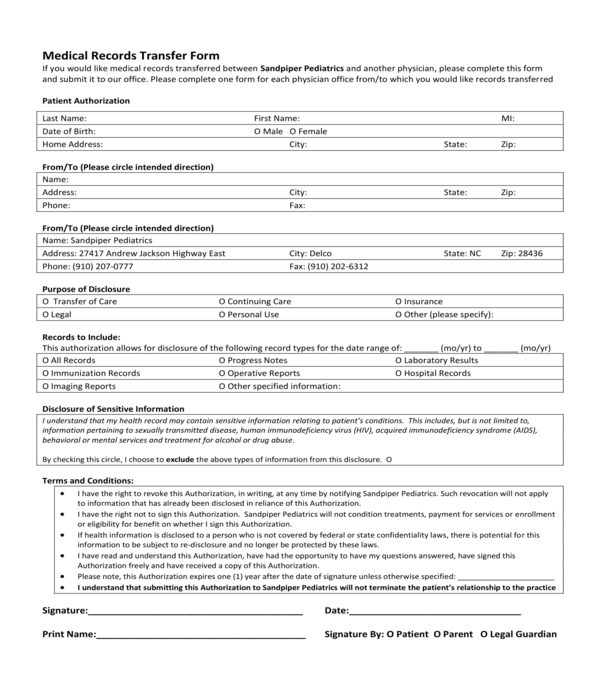 What is a Medical Record Transfer Form? 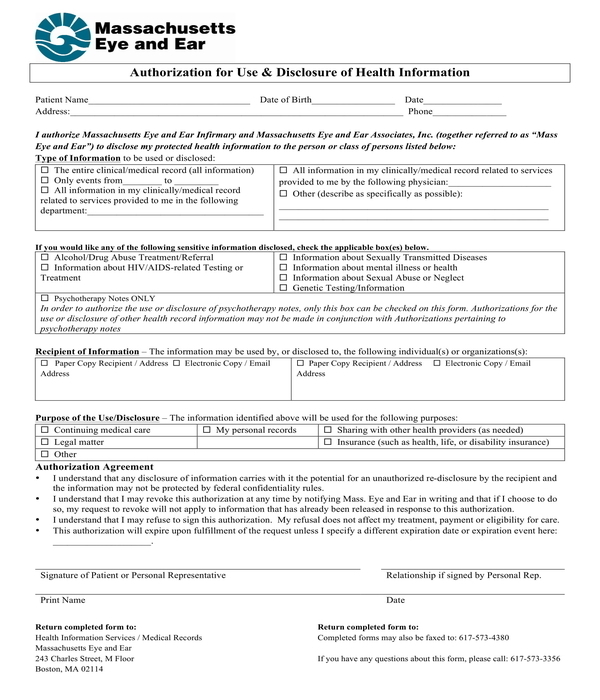 The US Department of Health and Human Services refer to an authorization as a detailed document that provides covered entities the authority or permission to utilize protected health information for certain purposes, which are often other than payment, treatment, health care operations, or to supply protected health information to a third party that is stated by the individual. Because there is a possibility that it is difficult to verify if there is ever a disagreement, verbal medical release agreements are not sufficient. A written copy on record is what is needed by a healthcare staff along with the corresponding signatures to protect themselves. 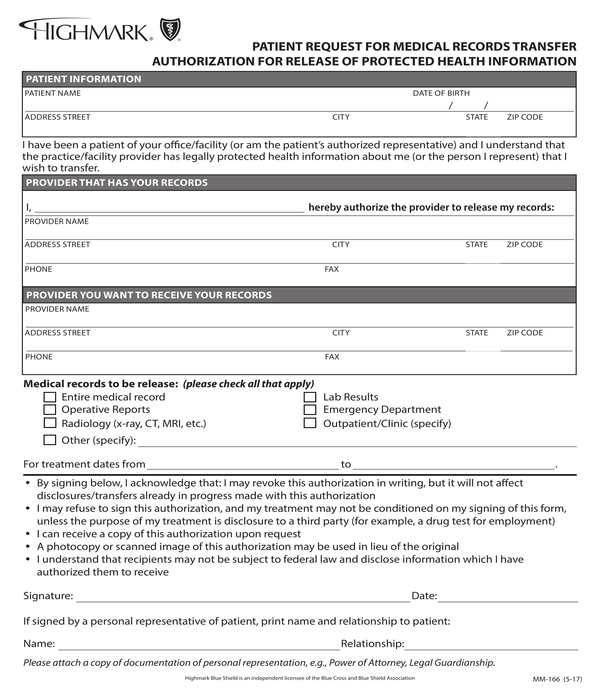 If ever a health care professional be instructed to share healthcare information on the patient’s behalf, ensure that patient signs a release form. 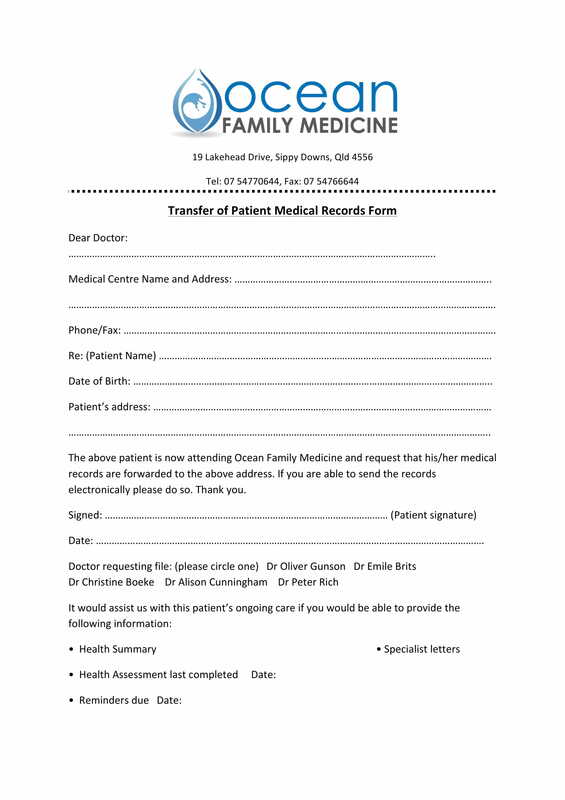 Information on Patient: This allows the form to be clear on who the patient is, their contact details including email address, home address, date of birth, social security number, and other information that is valuable to their identity. Receiving Entity’s Information: Be absolutely clear regarding the names, titles, addresses, and contact information, this ensures that the patient is clear who is able to access their medical information. 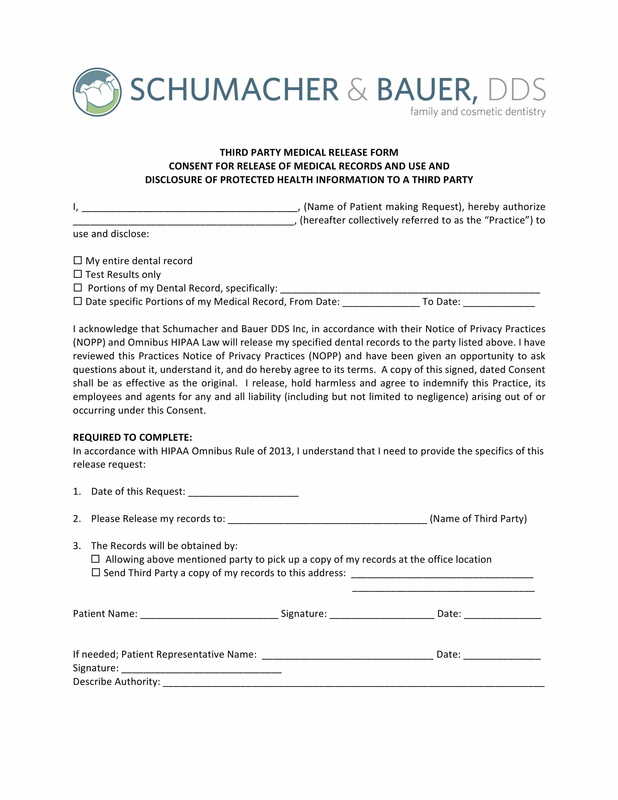 It is recommended that a patient fills a new form for each receiving party or separate forms. This allows you to pair different types of information with other recipients. Information to be Shared: Patient must be specific regarding the types of information, results, scans, tests, images, or notes to be shared. They can also limit the information they want to divulge, but they must continue to be thorough through this process of listing down. Purpose of the Transfer: Reasons on why a patient’s information is being released or transferred must be indicated. This minimizes confusion and avoids the unintentional spreading of information. Some options include social security certification, medical disability claim, college immunization notification, insurance claim, worker’s compensation claim, special consultation, etc. Expiration Date of Authorization: When a medical transfer form does not have an expiration date, this could mean that the recipient has access to patient’s medical information indefinitely, so it is much smarter to put in a date when the transfer form expires. The downside to this means that there is a possibility wherein you may need to request additional transfer forms when they expire when treatment is still ongoing. It is much wiser to protect your information by getting as much written approval as possible. Disclaimers: This gives the patients the knowledge regarding how the form will be used and the patient’s rights. 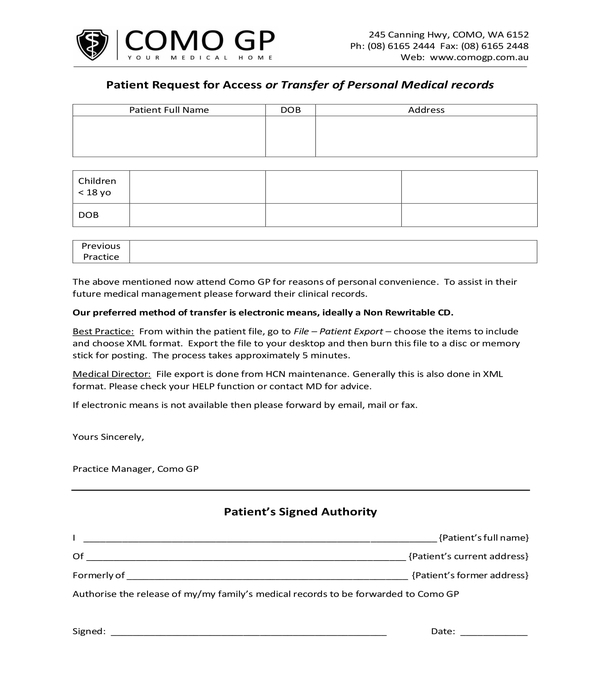 It allows a patient to be aware that they are under no obligation to transfer their information and can take back their release form at any time. 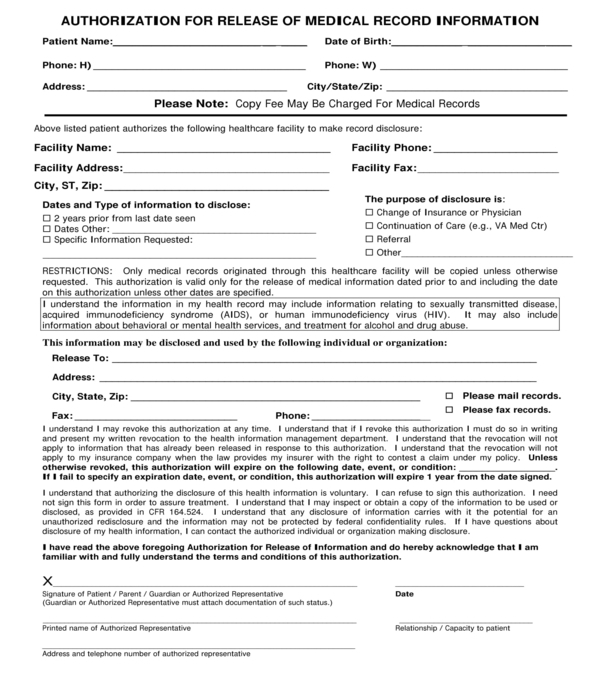 Signature and Date: End the medical transfer form with a signature and date. This makes sure that there is official authority given by the patient. 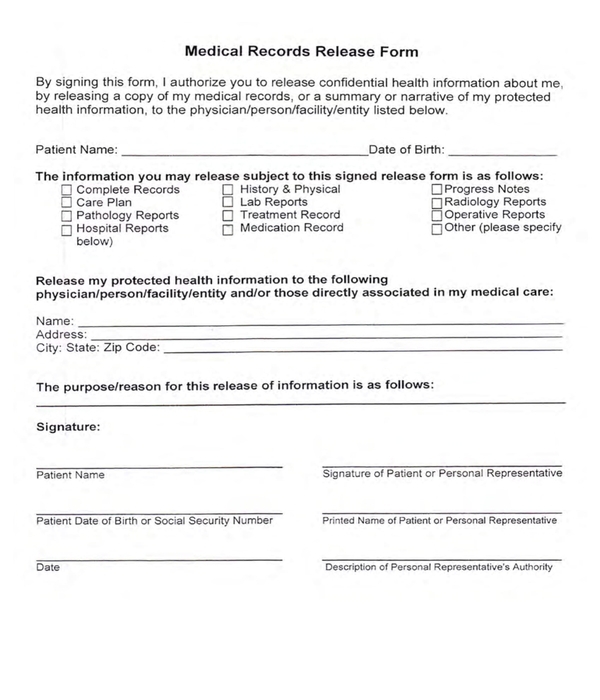 For online forms, e-signatures can be signed by patients. 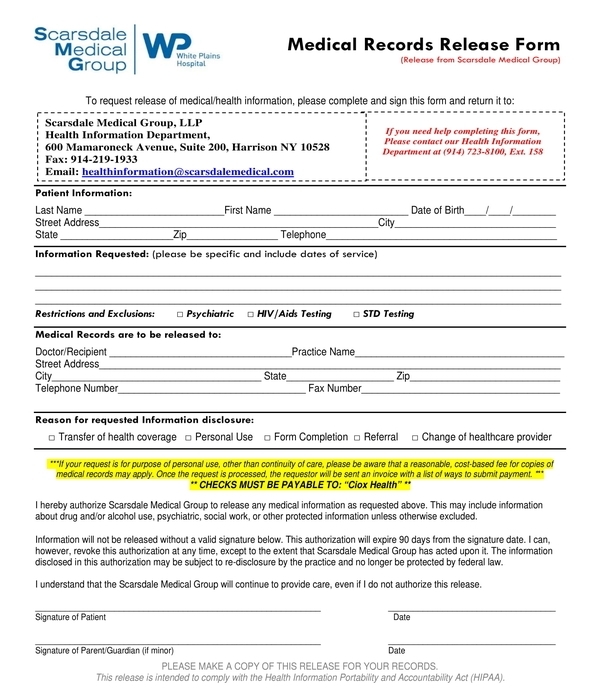 The Health Insurance Portability and Accountability Act has a Privacy Rule that allows a patient to receive copies of their medical records, whether they are kept by health care providers or their insurance company. Health care providers cannot deny a patient’s desire or request for records if you owe them compensation under this rule. They are also forbidden to charge patients for having to find and retrieve the patient’s records or files, but they are allowed to charge an acceptable fee to cover for the costs of mailing and copying the paperwork, and these costs differ from provider to provider. 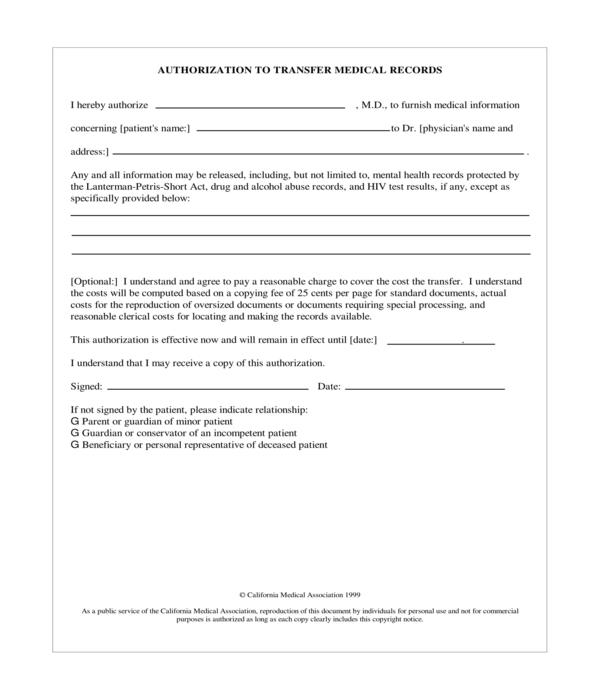 Step 1: Fill up a medical record transfer form that allows for a medical provider the permission to share the patient’s medical records with another health care provider. Step 2: Specify on the form what kind and type of information and records the patient wants to divulge. Step 3: Provide payment for any costs that may result. When all goes well, your records will arrive at the office of your new practitioner within a few days, and you will receive a bill for the transaction via mail. Should both offices be using updated electronic health record systems, the process is even easier. Most record offices can finish a simple request within the week even when the offices are relying on fax machines. What Should You Do When Your Request Process has No Update? Ask your new health care office regarding which records they need or are interested in. There is a possibility that your medical records include hundreds of pages, and chances are that your new physician might not be interested in everything. Before filling out an authorization form, ask the originating medical records office what your responsibilities as a patient is, and follow their instructions with care. You can even get on a first-name basis with a person in the office, and call them back once in a while to ensure that they have received your authorization and are working to accomplish your request. Inform the records clerk that your request for transfer is urgent. It is ideal to make your request at least a month before your first appointment with your new practitioner. In a few cases, record offices are inclined to hasten requests that are necessary to move quickly. Every week, call and check whether your records have already been sent. Persistence is crucial, but try not to hassle anyone. Under HIPAA, medical providers have about 30 days to process a request for records. A considerate reminder of your rights may be able to hasten up the process. 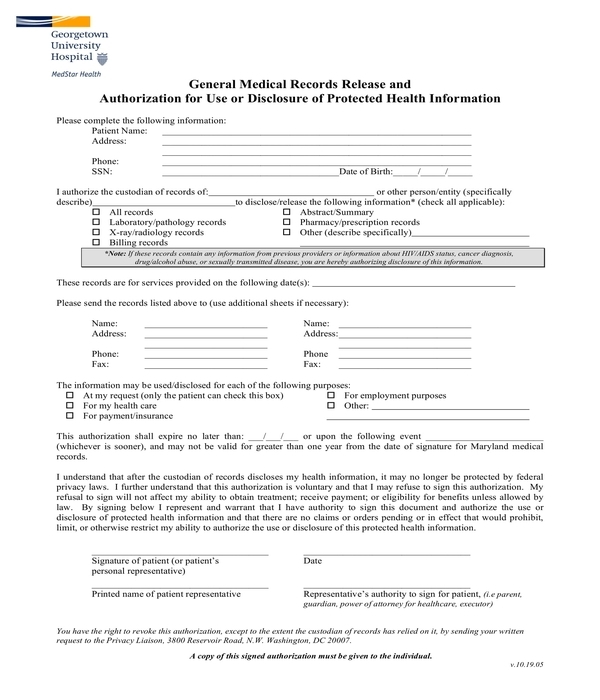 These medical records transfer forms or also known as medical release forms ensures that medical record entities follow all the correct protocols that especially under HIPAA especially in terms of confidentiality. Especially since medical records contain personal information that is quite sensitive, it makes sense why there are strict rules when it comes to release of medical records. What is a Medical Consent Form? What is a Medical Form?